Review by AllTheBestFights.com: 2016-06-25, one sided fight between Zack Mwekassa and Mourad Bouzidi: it gets two stars. Zack Mwekassa entered this fight with a pro record of 14-3-0 (12 KOs=86%) and he is ranked as the No.6 super cruiserweight in the world. He lost to Saulo Cavalari in 2015 (=Cavalari vs Mwekassa 2) but he came back to win in 2016 against Zinedine Hameur-Lain. His opponent, Mourad Bouzidi, has an official record of 79-23-2 (34 knockouts) and he entered as the No.4 in the same weight class. He also suffered his last loss against Saulo Cavalari in 2013 but then he has won four bouts defeating Danyo Ilunga in his last one. Mwekassa vs Bouzidi is valid for the interim Glory light heavyweight championship title; undercard of Robin van Roosmalen vs Sitthichai Sitsongpeenong 2 – Glory 31. Watch the video and rate this fight! Review: 2012-10-06, good second fight (with one knockdown in the second round) between Gokhan Saki and Mourad Bouzidi: three stars. Gokhan Saki ranked as the No.7 heavyweight in the world, entered the fight with a record of 76-15-0 while Mourad Bouzidi had a record of 65-18-2. In their first fight Saki defeated Bouzidi by unanimous decision (June 23, 2007). 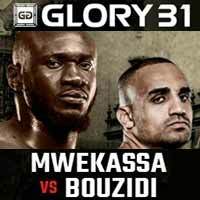 Saki vs Bouzidi 2 is on the undercard of Remy Bonjasky vs Anderson ‘Braddock’ Silva – GLORY 2 Brussels. Watch the video! Review: 2011-05-28, interesting fight for the heavyweight division between Errol Zimmerman and Mourad Bouzidi (Glory World Series). Zimmerman knocked down Bouzidi two times in the first two rounds but then he won by decision. Watch the video!